Volunteer for 9 years at the Ardgowan bookshop at Carnock Street. 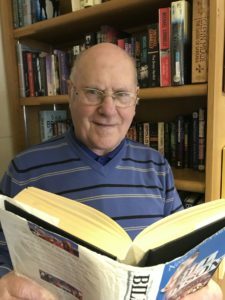 A self-confessed book worm, Michael loves his volunteering role accepting kind book donations from the community and selling them at Ardgowan’s Furniture Store to raise funds for the Hospice. Michael was an engineer but is now very happy being surrounded by books. His organisational skills are put into good practice as he catalogues the books into sections that would put the best library to shame. He was bought up in Govan and always remembers his father taking him to the library on his day off. It was a family trip he remembers fondly and is glad he could repeat with his own children and now grandchildren. He has 7 grandchildren and 7 greatgrandchildren. The whole family is still reading. He takes great pleasure from seeing children at the Hospice Book Shop. He says: “Books are wonderful – you can learn so much and it’s an important part of education”. He enjoys the banter with his work colleagues and particularly likes talking to customers. “You start talking about books and then you may talk about their worries and share some of your own. It’s a nice environment and I enjoy meeting people”, he adds. The book shop is laid out on shelves in sections that are categorised clearly. Each book is of high quality and just needs a new reader.